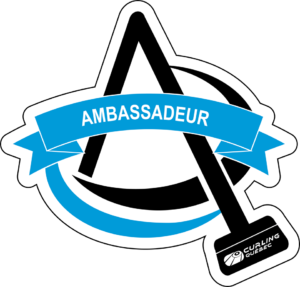 Ambassadors are ressourceful volunteers who act as the liaison between Curling Quebec and its members. Throughout the season, the ambassadors are notified about different programs, activities, tournaments, etc. The ambassadors are responsible for ensuring that the members of their clubs receive all of the information in regards to programs and championships organized by Curling Quebec, they should also relay and questions or concerns from their members to the federation. A crest was created by CQ in order to easily identify the ambassador in each club.